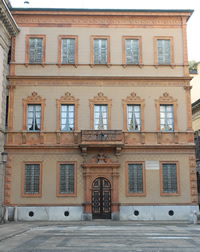 In the course of his long life Alessandro Manzoni lived in many different properties, but the only house that may truly be considered his own is the one located in Via Morone 1, Milan. Following his marriage to Enrichetta Blondel in 1801 and the birth of Giulietta, the Manzoni family left Paris pretty much for good, finding temporary accommodation in 1810, in Via San Vito al Carobbio no. 3883, and then more hospitable surroundings in Palazzo Beccaria in Via Brera 6 (then no. 1571). On 2 July 1813 their second child Pietro was born, in the same house as Giulia herself previously. The expectation that the family would increase further in size, and the desire for a stable home in Milan, drove Alessandro to acquire a small townhouse in the area of Contrada del Morone, on the corner of Piazza Belgioioso known as San Martino in Nosiggia, the name of the church that had been recently demolished there. The house, owned by Don Alberico De Felber, was bought on 2 October 1813 for a price of Lit. 107,000. In a letter to her uncle Michele de Blasco dated 26 July 1814, Donna Giulia Beccaria expressed her profound satisfaction at the choice: ‘We find we are delighted with our new house, on account of its aspect which is truly pleasant, both in winter and summer’. One decisive factor in choosing the De Felber house was its position in the centre of town. The family circle was guaranteed by the fact that their few close friends were in the vicinity: Federico Confalonieri and Silvio Pellico in Via Monte di Pietà, Porta and Verri in Via Monte Napoleone, Vincenzo Monti in Via Brera. Not far away was the Biblioteca Ambrosiana, the Braidense, the Gabinetto Numismatico directed by their friend Gaetano Cattaneo, the libraries of Santa Margherita and Contrada dei Servi. The central location was perfectly suited to both the scholar’s requirements and to maintaining personal relationships. Well aware of this privilege, when a few years later the temptation to return to Paris became pressing, and financial troubles prompted talk of selling the Brusuglio villa and even the house in Via Morone, Giulia wrote as follows to her brother (from Paris, 4 January 1820): ‘Do what seems best to you, but I warn you, sooner or later you will have to start looking for an apartment in your and our vicinity, I do not wish to take leave of this magic circle, please bear that in mind’. Soon afterwards, as she wrote on 13 March 1820, she took on the role of designer and restorer, submitting her plans for major work on the house to her brother: ‘I am keeping on the house in Milan, and I pray you would look again at my previous letter, where I suggested many improvements, so as to decide on which ones are indispensable and to be effected without delay’. Much of the work was completed, some of it was postponed, but over time the house began to take shape based on the needs of a family of twelve: Giulia, Enrichetta, and Alessandro with their varying requirements, plus nine children of different ages. Whereas Giulietta was already of marriageable age and admitted to the grown-ups’ conversations, Filippo and Matilde, the two youngest, still needed a bonne. The many rooms, spread over three floors, also provided convenient servants’ quarters, as well as welcoming hospitality for friends. One quiet room, overlooking the garden, was set aside for Manzoni where he could retire to read, think and write. This room became the perfect place for entertaining close friends and the distinguished visitors who increased both in number and frequency in the years that followed, as the fame of The Betrothed spread. 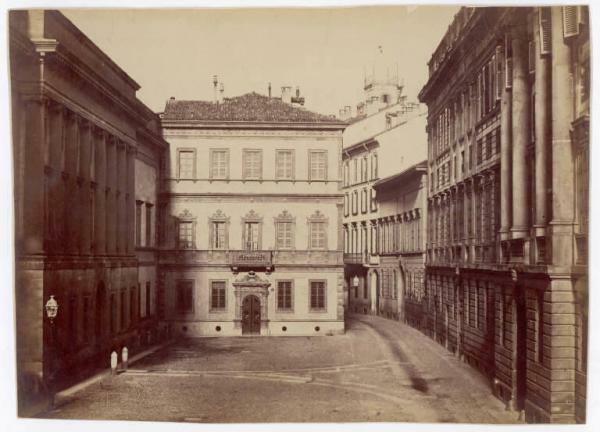 While Renzo, Lucia, the Nun of Monza, the Unnamed, and plague-ridden Milan took shape and written form on the ground floor, the first floor was where family life happened. Giulia supervised, Enrichetta attended to the children’s education, and both shared the work involved in keeping the home happy and welcoming. With the death of Enrichetta, aged just 42, at Christmas 1833, and the still more premature departure of Giulietta, aged only 26, the atmosphere inevitably saddened, the voices turned to whispers in order to contain such inexpressible pain. Alessandro preferred to shut himself away in the study, struggling to find words to put down on paper, his mind inactive. A degree of serenity returned with his marriage to Teresa Borri Stampa, who entered the household in Via Morone in1837 with her seventeen year old son, and an awareness of being the wife of the most eminent and admired writer in Italy. Teresa took the rooms on the first floor, choosing a large room for herself overlooking the garden and giving access to the study via a small staircase, from which she was able to observe Alessandro’s meetings from above. An unexpected outcome of this by no means infelicitous union was the birth of twin baby girls, one stillborn, the other surviving her by only a few hours. Donna Teresa’s grief and her age (by now she was 46) allowed illness and fatigue to enter those no longer happy rooms. The laws and injustice of the times, his marriages and the premature deaths of his sons and daughters (only Enrico and Vittoria survived him) were perhaps intended to create a silence around Manzoni, in which he would await his last visitor alone: his own death, which came on 22 May 1873. Following his death the house was put up for sale by the heirs, for the price of Lit. 280,150. It was bought by Count Bernardo Arnaboldi Gazzaniga, who, out of respect for Manzoni’s memory, allowed the study and bedroom to be visited once a year, on the anniversary of the death of the ‘Illustrious Departed’. In 1919 the house was bought by Attilio Villa, and in 1922 by the Dubini brothers. In 1937, now the property of Cassa di Risparmio delle Provincie Lombarde, it was donated to the municipality of Milan for perpetual and exclusive use by the new national centre for Manzoni studies (CNSM), set up by royal decree under Italian law no. 1679/37. On 20 March 1941 the rights to the building were handed over to the City of Milan by the Centre, while preserving the perpetual and complete right of use. When the Centre inherited the house it had undergone a number of alterations by the previous owners, who modified the disposition and use of the rooms. Under the guidance of Marino Parenti, the Director at the time, work was begun on restoring the house as it would have appeared at the time of Manzoni’s death. The work was interrupted by the events of the Second World War, and was resumed and completed in 1960s. The Manzoni Museum was inaugurated on 15 December 1965. Fifty years later, to coincide with Expo 2015, new restoration work was carried out, sponsored by Intesa Sanpaolo, with the aim of affording the Museum’s visitors greater access, but also of making Casa Manzoni an even livelier cultural hub for scholars and all citizens of Milan.